I think it boils down to how you see Froberger. Stella chose clearly for the Italian/ Frescobaldi angle, with its slownes, hesitations and phrasing. His approach is reinforced by the use of a rather small and dry sounding harpsichord. It's astonishing how Frobergerian some of the suites here are, the more so than anything by Purcell I think. I'm thinking of the ones in C and G really. 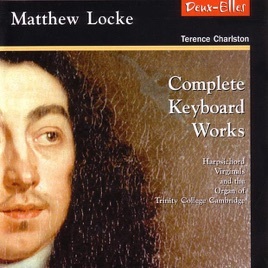 Apparently Froberger visited London and Locke mentioned him as an influence. Anyone have a view on Alina Rotaru's Froberger? IMHO Alina Rotaru's single CD is simply marvellous, very well chosen pieces, beautiful harpsichord Ruckers. My very first Froberger disc was Siegbert Rampe's (who was Rotaru's teacher) : powerful, dramatic, intense. Rotaru's recording stands well alongside her master's. Tombeau pour Blancrocher is a must !! She ends it in a surprising manner !!!! How do you actually buy the Tommaso disk? I downloaded via Amazon. I know it’s not everyone’s choice for good sound. Anyway, another great recommendation by Mandryka! I found this on iTunes and downloaded it, very strange recording, you have to have it turned down very low otherwise it sounds awful, but the arrangements are very compelling. It made me think how I'd like the hear some Froberger arranged for lute. Has anyone done this? I had the same thought about lute. I'm sure I've heard some Froberger on lute but I can't remember the details, if I ever find it again I'll mention it. I'm so used to listening to quiet instruments, viols and harpsichords, that I never noticed a problem with the sound of Oreste de Tommaso's CD, my stereo is mostly turned down low. I think it sounds pretty truthful. I'm glad people seem to find it stimulating. I know that solo music for viol was pretty widespread, and that violists made transcriptions. Froberger played viol. I hear the CD through Qobuz, which will have better sound than amazon and possibly itunes too. The practice of transcription holds a prominent place in the baroque era, not only responding to a pragmatic interest that finds solved the problem of of coming up with new musical ideas from scratch. Adapting and elaborating a musical idea to the possibilities and idiom of the new instrumental means poses an interesting task to the arranger, who must pick the essence of its content and transform it, making the new transcribed work autonomous in its own right. For example, J.S. Bach reinvents the Prelude of the Third Partita into the amazing Ouverture of Cantata BWV29, that featuring concertato organ, trumpets, strings and continuo results satisfactorily autonomous from the violin version with which shares its musical content. In the spirit of the age, and at the light of the composing tradition for a solo bowed instrument, my transcriptions are destined to a five-string cello, a typology that must have been very popular until the end of the 18th century. This instrument is the bass member of the “viole da braccio” family, that in this instance is played vertically, and it benefits from the tradition of composing for solo violin. But even more than being influenced by this, the style of composing for solo cello is deeply affected by the rich tradition of composing for the lute and the viola da gamba. These organologically distinct families of instruments have their own bass members, that share with the five- string cello the low-octave extension. Double stops and chords play nicely and easily on the violin, especially by virtue of its thin treble range, whereas on bass instruments it is more effective a style of horizontal polyphony. Horizontal polyphony may be described as the musical counterpart of the painting technique of “trompe l’œil”, by which the eye is deceived to see three dimensions on a two-dimension surface. The renowned cosmopolitan composer Froberger remains an inspirational figure both for his contemporaries and for future generations, as in composing his Partite he is instrumental in the development of the Suite as a genre. In these Partite, his style rarely takes overtly the shape of counterpoint, but rather follows closely the “stil brisé” of baroque lutenists and the extension of a baroque lute. 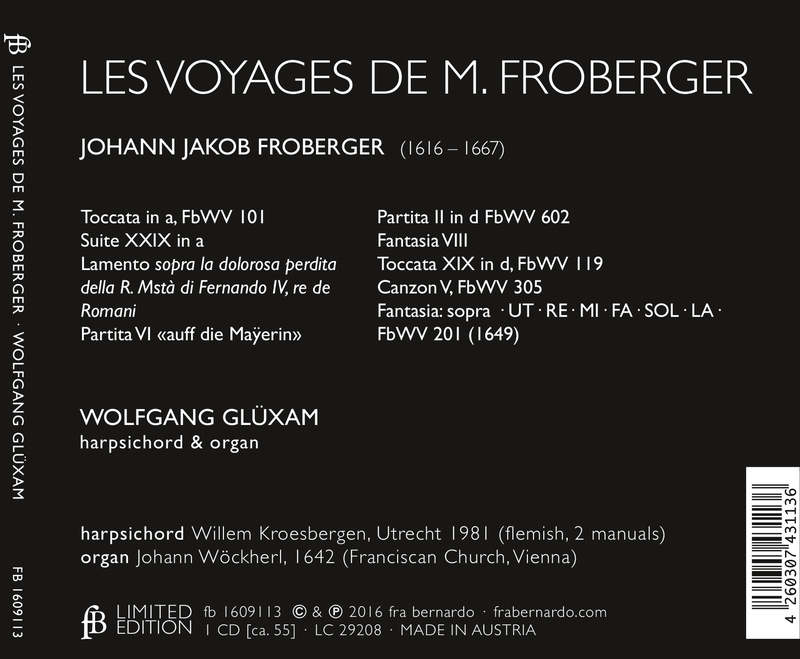 Froberger visits Paris, he is friend with Huygens, comes into contact with the great masters of the lute Denis and Ennemond Gaultier Le Vieux, Blancrocher, and with the violist-lutenist Nicolas Hotman. All the musical “entourage” of the court of Versailles affects deeply Froberger, who newly elaborates these influences into his own personal idioms. His Partite, rich of broken lines, are well suited to be adapted to an instrument such as the five-string cello. If this is more limited, compared to the harpsichord – with respect to the possible number of notes playable simultaneously - it certainly offers interesting opportunities in terms of articulation of sound, dynamics and resonance. Allemandes, Gigues, Courantes and Sarabandes flowing one after the other constitute what Kircher defines as “stylus choraichus”, overtly based on the step units of French dance. The hierarchy of the beats within phrases is unequivocal. Thesis and arsis - strong and weak accents -alternate, infusing living energy into the typical steps of dance in a circular and harmonious natural flow. This flow pulsates regularly, the very idea of a regular “tactus” so much held in estimation by the masters of Renaissance, becomes here a structural element. Speaking-music is the prominent feature of the Allemandes, where their content is inspired to the rethorical figures of speeches, these ones not necessarily always declamed aloud. The character of each dance becomes a diversifying building element as these Partite are often cyclical in including monothematic ideas. In these transcriptions, my objective consists of imitating the “stil brisé” of lutenists that had also been successfully employed by violists, such as Alfonso Ferrabosco, Maugars e N. Hotman, who used to play both the viol and the lute. In this style of playing, broken fragments of lines imply their complete parts and create the illusion that polyphony is at work, whereas the instrument playing is only one, albeit this becomes independent in presenting both a melodic line and a fundamental bass. I have also chosen to use different tunings, in common with the contemporary practice of the Baroque . Widely documented in the contemporary sources of the lute, “viole da braccio” and viols, this practice explores into the possibility of widening the sound-palette of each instrument, searching for an ideal sonority suited to each work. As a typical example, Biber experiments in his Mystery and Rosary Sonatas different tuning on a violin, imitating the lyra-viol, with her numerous possibilities of tuning. Thus in these Partite I have used four different tunings: one in C G d a d’, another in C G d g c’, another one in E G d a e’, and one in Eb Bb f c’, with the fifth string tuned to AAb. Special effects of resonating overtones, chords and multiple stops that would be otherwise impossible to obtain, become possible almost by magic, thanks to the adoption of the new tunings. The principle of resonance, fundamental to the musical aesthetic of the Baroque, had been inherited from the Renaissance, together with its poetical and philosophical implications. The contemporary techniques of instrument-making tend all towards satisfying this essential and vital principle. Lutes are set up with double strings, the courses, viols are built as lyra-viols with symphathetic strings, the “da braccio” family flourishes into the viole d’amore. Even in the Classical period, instruments such as the baryton, much favoured by the Prince Esterhazy and enriched by the compositions by F.J. Haydn, still reflect the contemporary musical taste and the importance given to this fundamental principle. My cello is stringed in gut, as gut strings facilitate a clear sound-attack and provide opportunities in choosing amid the consonant syllabs of articulation. The colour-palette offers wide choices and facilitates pursuing the different parts in perspective at play. The dynamic range is wider compared to what it can be obtained with strings made of other materials. The bow that I use is of a convex shape, with a fixed-frog, following the common usage of the 17th and 18th centuries. The baroque cello deserves some more attention : which kind of instrument is it really? Recent musicological research shows us that this instrument exists in a variety of formats, from the small enough to be played on your arm, to the large “church bass”, also known as “basse de violon” in France and tuned to Bb in the orchestra of Lully, or even in Eb as a “basse de Lorraine”. In addition to this variety of formats, the number of strings, by no means restricted to the four of the classic type, includes the typologies with five and six strings. These are cited by the authoritative sources by Matheson, Walther and Brossard, finding their counterpart in iconographic evidence. There seems to be unanimous agreement within the contemporary iconography in representing players who hold the bow with the under-hand grip. This evidence fully concords with the famous and well-known account by Charles Burney, who in his chronicles tells us of a meeting with Vandini, the cellist who used to play with Tartini. The former still performed with the under-hand bow grip toward the end of the 18th century. Not only is this grip functional to the natural alternation of the push and pull bow strokes that breathe life into the musical phrase, but also facilitate the changing of string. Conversely to modern practice, changing string is sought after, as it enhances the resonance of the instrument. Worth of note is the fact that many cellos were fretted, just as viols and lutes. Drawings by Stradivari have come down to us that shows his calculations to fit frets on a neck, before this was modified, alas common destiny of so many baroque instruments. A fret, by no means limited to being a visual aid for fingers to find their place on the strings, is essentially a sound-mechanism to imitate the resonance of the open string as much as possible. Although the evolutionary path showed by the French school at the end of the 18th century will lead to the standardised format of a cello with four strings, with a fretless neck and played with a bow-grip held in the same manner as on the violin, I have let the idea of a sound that is characteristic of the Baroque guide me. It is exactly in this idea of sound that the Suite lives its Golden Age. Tilman Hoppstock has recorded a Froberger suite on guitar, and in fact I think that Andres Segovia recorded a bit of Froberger. Nothing on lute that I can remember yet. As to Van Asperen's organ recordings - I have to date vols. 5 & 6 - I can understand your hesitations…. I think it is good, and certainly good enough for me to continue and complete the series. But they are not "da bomb" as harpsichord are…. In a way they remind me of how Van Asperen used to sound on the harpsichord: studious, on the conservative side. I can imagine other players to infuse some more life into it. Andre Marcon comes to mind (he did a miscellaneous recital that includes some Froberger on DIVOX), also expert in the Southern Germanic organ School, Joseph Kelemen. To my surprise he did an entire Froberger disc on Arte Nova that I need to track down… Another candidate might be Stefano Molardi. PS Now Aeolus has concluded the entire series a boxed reissue might be in the cards? Perhaps better to wait and see, Harry! 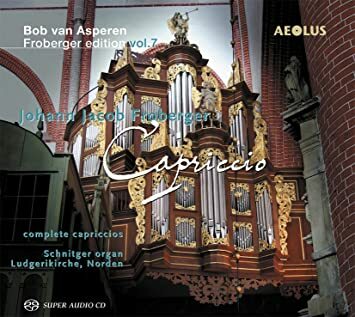 Right, well over the past few days I’ve been listening to Vol 7, the Capriccios, played on the Norden Schnitger, it’s wonderful: music, performance, organ, sound, booklet essay - all wonderful. Off the top of my head I can’t think of a better recordng devoted to Froberger’s Italianate music on organ. The CD is, IMO, the summit of the Asperen Froberger series. The complete set by Simone Stella (Brilliant) has quite some fans too, and his approach to the organ works has a lighter touch and is more frivolous than the more profound Van Asperen. One thing that I find really haunting is a little Fantasia that Glüxam plays on organ, FbWV 208. No one else has recorded it on keyboard that I can find, though there is a viol performance. 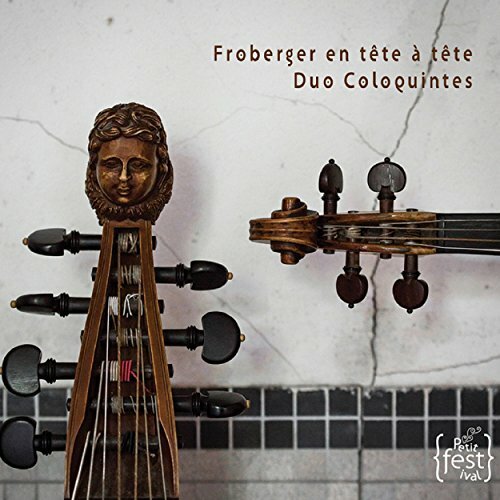 The Duo Coliquintes booklet is well researched and they confidently attribute it to Froberger, though they say that their source is in a viol anthology, I don’t know if they mean to suggest that there is no other source. Anyway better on organ. It’s very simple, probably early or maybe not reliably by Froberger at all. Beautiful. Do you think the Van Asperen series is worth getting for those like me who already have Stella's set? I also have Rampe's two discs on MDG and his Virgin Veritas x2 double, as well as a 2CD set on CPO and Glen Wilson's double on Naxos, but as Van Asperen's is a complete set I'm considering it. However, the "cheapest" I can find it is the offer from Aeolus - all 8 volumes for 135 euros plus whatever they charge for shipping. That is not, to put it mildly, a casual purchase, but if it's really worth it I'll start putting some cash aside and hopefully pick it up in a month or two. 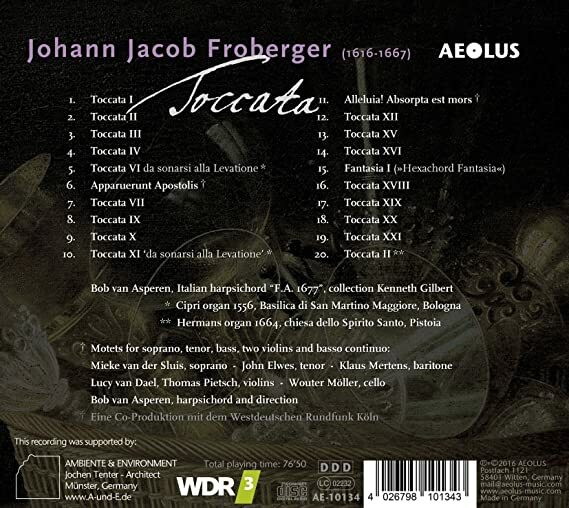 I do not know whether I enjoy Egarr’s Froberger recordings more than Asperen’s. I would say that the two things that characterise Asperen in these pieces are a desire to promote their coherence and his sensitivity to the affective possibilities in the music. The result is more linear than we may expect (I don’t say that that’s a weakness necessarily) and more poignant. His harpsichord is very well recorded, and it is a quiet subtle instrument rather than an in your face brilliant one. To some extent what Asperen does reminds me of Leonhardt’s Frescobaldi on Alpha, though I’d have to go back to listen to see whether there’s anything to be made of that. The highlight of the experience included Glüxam’s organ performance of the 19th toccata - the organ music at the end of his Froberger disc is turning out to be a real revelation. Another highlight was the rediscovery of Vartolo in FbWV 112 - Vartolo’s Froberger is just wonderful. I have listened to all of Asperen and some of Stella since you made that post. And I now say this with confidence: Asperen’s set is indeed worth getting even for those who, like you, already have Stella, Rampe, Rémy on CPO and Wilson if you are interested in the ricercari, toccatas, capriccios. What you have is very good for suites, and I personally would say that Vartolo is a greater priority given you have Wilson and Rampe, even though Asperen has its own interesting ideas about how the suites should go. It’s very good to have the ricercari and capriccios collected together, with Asperen’s notes, the CDs have helped me to appreciate Froberger’s Italian style much more. Many thanks for this! I'll start saving some cash to get Asperen's series. Vartolo's double CD on Naxos is on the way - I saw it on ebay for the grand sum of £2.58, which was just too good a bargain to resist.